Our next stop that day was the City of David, which is just across the Kidron Valley from the Mount of Olives and south of the walled Old City of Jerusalem. You can literally walk across the street to get from the walled Old City of Jerusalem to the walled compound of the City of David. 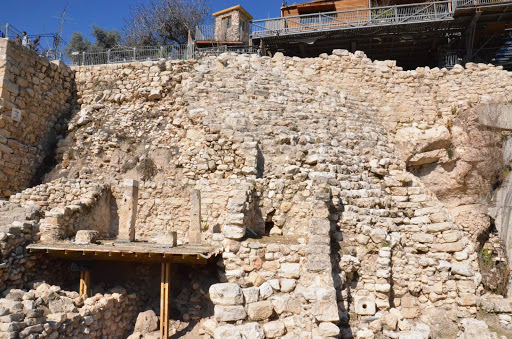 The City of David is now an archaeological park; it is historically and biblically significant because this is where King David—Israel’s second king—established his capital (2 Samuel 5:6-11). Before this time, the Hebrew people had been divided—Judah was following David, while the tribe of Benjamin (Saul’s tribe) and the other 11 northern tribes were following Saul’s heirs. Later, Judah and Benjamin would become the southern region of Judah and the other ten tribes would become Israel. Now the words Jew (from Judah) and Israelite are used interchangeably when referring to God’s Chosen People, the Hebrews. The City of David is very narrow, about 260- 320 ft wide. On the east side, facing the Kidron Valley, there is a very steep slope of about 60 degrees. Despite these drawbacks, it was chosen because of its water source– the Gihon Spring (2 Chronicles 33:14). 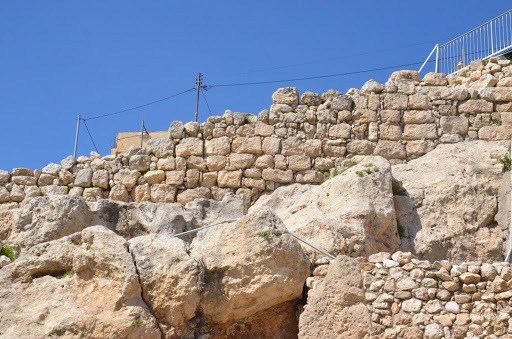 We had to walk down a couple of flights of steep steps to come out on the east side of the City of David, where we were able to see two stone structures uncovered during excavations. The ‘Stepped Stone Structure’ is one of the largest Iron Age structures in Jerusalem dated to the end of the Jebusite city (destroyed by David). The other is called the House of Ahiel, which is representative of a typical Israelite four-room house. 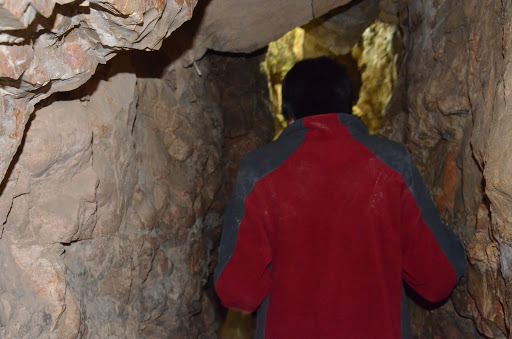 Next, we were able to descend into some underground excavations and saw Warren’s Shaft, the spring of Gihon and Hezekiah’s Tunnel (2 Kings 20:20 & 2 Chronicles 32:30). Warren’s Shaft, named after its discoverer, was an underground means of getting water from the Gihon without leaving the safety of the city walls. There has been some debate about the feasibility of Joab climbing through this shaft to conquer the city, but no one has been able to disprove that this is the shaft spoken of by David in 2 Samuel 5:8. Hezekiah’s Tunnel, also called the Siloam Tunnel, was built by King Hezekiah to bring water from one side of the city to the other. 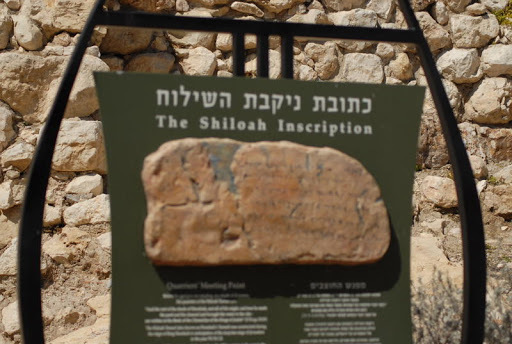 The Siloam Inscription describes in detail how the workers dug from opposing sides ’til they met in the middle. According to the 2 Chronicles 32:1-8, Hezekiah was trying to keep the Assyrians from using the Gihon Spring, which was located outside the city before this construction project. He accomplished this by blocking the springs outside the city and directing them underground through the tunnel. This winding tunnel at 1,050 ft long, is considered one of the greatest works of water engineering in the pre-Classical period. It turned out that the Assyrians did indeed besiege Jerusalem (Isaiah 36), but the Angel of the Lord killed 185,000 Assyrians that night while they lay sleeping (Isaiah 37:35-36 & 2 Kings 19:34-35). It was so nice and cool down in the shaft and the tunnels, I could imagine that during the grueling summer heat of Israel, it might have been a treat to have water fetching duty, just to partake of the natural air conditioning. We were able to go deep into the earth and see (and touch) the rushing waters of the Gihon. Some places in the tunnel were even wet and so narrow you could only pass through sideways. There is still much excavation and re-construction going on in and around the City of David and even below. When we came back out on the eastern side of the City, we were looking out over the Kidron Valley again, and a Muslim neighborhood that is adjacent to the southern end of the City of David. We sat out in a courtyard at the southern most point of the City and could look up at the remnants of Nehemiah’s wall (Nehemiah 3)! It was pretty exciting seeing that section still remained. We went out a gate from here and down a very steep hill to get to the Pool of Siloam. The Pool of Siloam is where Jesus healed the man blind from birth (John 9:7). It is a pool cut out of the rock on the southern slope of the City of David. It is fed by the Gihon Spring carried there by two aqueducts. There is an upper and lower pool. The huge stone steps leading down from the upper pool to the lower pool were only recently discovered in 2004. There are records indicating there was a lower pool during the Second Temple period, this has led to speculation that these were another of Herod the Great’s monumental construction projects. 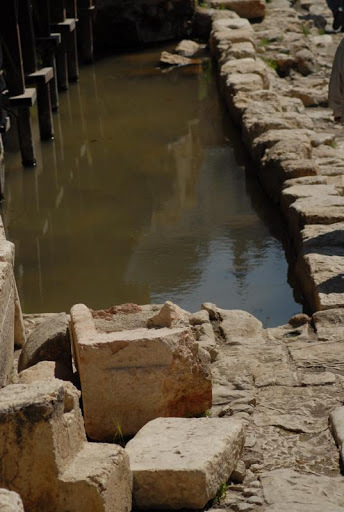 However, the pool has not been fully excavated because the land above it is owned by a Greek Orthodox Church and it is occupied by the King’s Garden (Nehemiah 3:15). Raouf had us all sit on these gargantuan stones looking down to the remnants of the lower pool, while a volunteer read from John chapter 9. Next, we turned to our right (west) and walked into another tunnel which was wet and cool, and still being excavated. We had to stop when we got to its furthest point of current excavation. They have not finished digs in this area due to disputes between landowners above ground and those who want to continue excavating below their houses. The steps in this area are of the same large hewn rock that leads to the lower pool. This was typical of Herodian architecture. If we could have continued along our path, this stepped stone street (Siloam Road) ascends all the way from the Pool of Siloam to the Temple Mount; it was once a major artery for foot traffic. If fully uncovered, the steps would be 25 feet wide; as it was, we were only able to follow a narrow passageway to its current end. 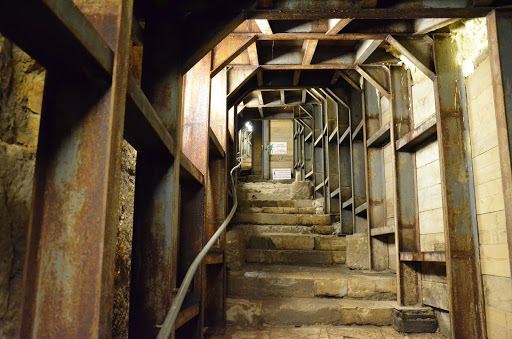 Later this day we would get to see the northern end of this path, as it is visible underground at the Western Wall excavation site (aka the Rabbinical Tunnel). By this time we were all hungry, so we hopped back on the bus and headed to Kibbutz Rachel Ramat for lunch. After eating, and patronizing the gift shop, we rode to the Old City of Jerusalem. Traditionally, the Old City is divided into four quarters: Jewish Quarter, Christian Quarter, Armenian Quarter and Muslim Quarter. We entered the Jewish Quarter via the Dung Gate. After going through security, we passed through Western Wall Plaza, then up a long ramp/tunnel to the Temple Mount which lies in the Muslim Quarter. The Temple Mount is the location of Mount Moriah, where Abraham bound Isaac, and the location of the First and Second Temples. The First Temple was built by Solomon (2 Chronicles 3:1) in 957 BC. It was destroyed by the Babylonians in 587 BC, under the rule of Nebuchadnezzar II– this marked the beginning of the Babylonian captivity (2 Kings 24:10-13). Seventy years later, the Persians conquered Babylon, bringing an end to the Babylonian Exile (Daniel 9:1-2). Cyrus the Great then issued a decree that allowed for the Jews to return to Jerusalem and rebuild the temple (Ezra 1:1-4 & 2 Chronicles 36:22-23). The Second Temple was built initially by Zerubbabel in 516 BC (Ezra 3:8). It was renovated by Herod the Great, King under the Romans, around 19 BC. Called Herod’s Temple, it was a magnificent structure. 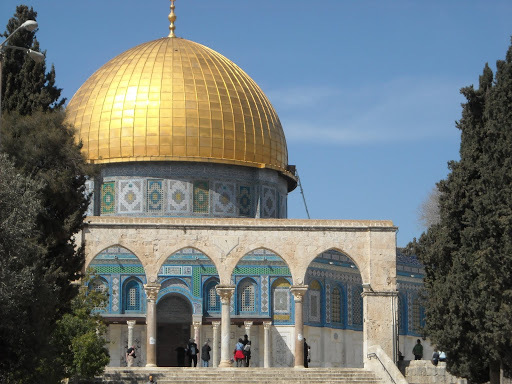 The Third Temple will be built somewhere on the Temple Mount, but the Dome of the Rock- a Muslim holy site- is located where the temple is to be rebuilt. The Third Temple will be desecrated by the Antichrist at the beginning of the Great Tribulation, and destroyed by an earthquake during Jesus’ Second Coming. The Fourth Temple, or ‘millennial temple’ is described in Ezekiel 40-46 and will be built by Jesus ‘the Branch’ (Zechariah 6:13). As we entered the Temple Mount, a man watching the entrance insisted that my daughter and I put on jackets, although we were not the only women in our group wearing short sleeve shirts. Raouf took us to stand as a group under a tree just in front of the steps to the Dome of the Rock. He gave us some historical and biblical background on the area. It turns out that the Dome of the Rock– built in 691 AD–is merely a shrine, not a mosque. The building across the courtyard we were standing in (south of the Dome) is more important to Muslims. 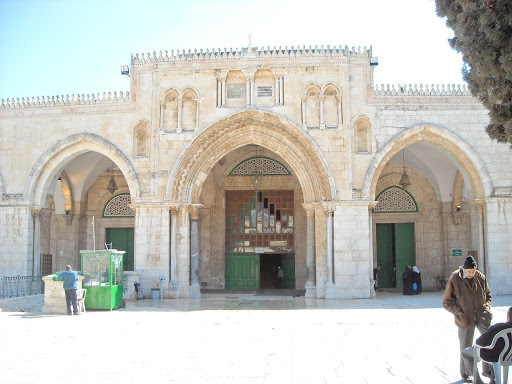 It is a mosque called Al-Aqsa Mosque, this is where the men actually pray. It has been destroyed many times by earthquakes since it was built in 715 AD. The Dome, however, is built on bedrock, so has suffered very litle damage over the centuries. After Raouf’s talk, we commenced to ascend the steps to the Dome. However, as we were standing on the steps on the eastern side of the Dome, facing the Eastern Gate, some men came and started rushing us out of the area. We had already planned on taking a group picture in front of the Golden Gate (Eastern Gate), so we hurried down the steps and over to take a quick group pic with the shut up gate behind us. 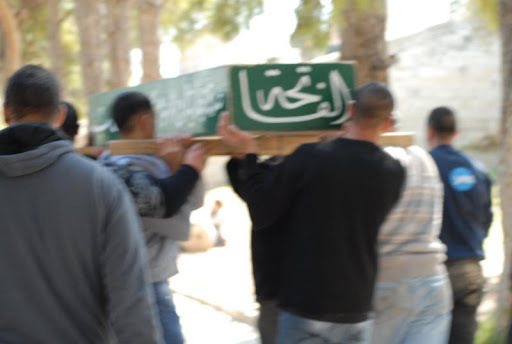 As we were hurried along, out of the Temple Mount area, we saw some men coming towards us carrying what appeared to be a green casket with Arabic writing on its sides. As they rushed by, I clandestinely took a quick picture. It wasn’t easy, because we were all still rushing forward and I was aiming my sister’s camera backward toward the men who had just passed. As strangely as all the men in this area had been acting since we entered, I didn’t dare take a pic as they came toward me. Quickly, we left out the Temple Mount’s compound-like area and found ourselves in El-Ghazali Square. We were still in the Muslim Quarter, but not on the Temple Mount. To our right was the Lion’s Gate (to the east), with the Pool of Bethesda (sometimes written as Bethsaida) to the west. We entered the Via Dolorosa and headed west to St. Anne’s Church and the Pool of Bethesda.